Window treatments have changed with time. From the rich drapes to the minimalist looks of simple blinds, the options seem endless. 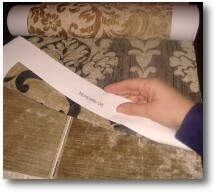 So, the first step is to have some idea about what kind of window treatment you want in the room. The right curtains can lend the room the ambiance you require. Well chosen and fitted curtains can breathe an air of beauty, create a restful atmosphere or give excitement to a room. However the wrong choice can spoil this so selecting the right window treatment is important. We offer a measuring and consultation service so that you can choose the right style and fabric for your windows, there is no charge for this. Our own workrooms produce curtains lined or interlined, pelmets, swags and tails, Roman blinds plus much more. We have a wide range of quality curtain fabrics from leading designers and manufacturers at very competitive prices. We offer a full fitting service with a vast range of poles and tracks to suit all tastes. We also specialise in fire retardant fabrics for the contract market.